ROACH CONTROL - "We kill what bugs you!" American roaches are the most common species found in central Texas. 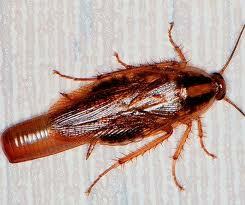 Most properties will have some form of conducive condition on them that will allow American roaches to live. They prefer to live in dark, damp, and cool areas. 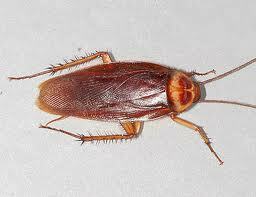 American roaches tend to live outdoors and occasionally invade residential structures. Commercial structures tend to have a greater problem on the interior. Elimination of the conditions that are conducive to their harborage is important for a succesful treatment. Give us a call, whether you just need a onetime treatment or are on a Monthly or Quarterly Treatment Program we've got you covered. 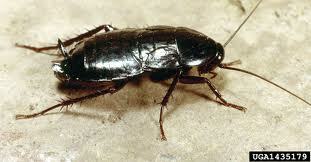 German roaches in most cases will infest at a much heavier rate than American roaches. They reproduce at a much faster rate and require several treatments for an infestation to be eliminated. Structures where sanitation is an issue or old food items are not disposed of properly will be the most conducive for large infestations. German roaches have been implicated in the outbreak of certain illnesses, the transfer of a variety of pathogens, and allergic reactions in many people. It is very important to get a trained pest control provider as soon as possible to quickly eliminate the problem. Give us a call for additional details regarding our German Roach Treatment program. The Oriental roach is not as common as the German or American but does still exist in central Texas. In most cases it survives quite well outside and spends most of its time there. Leaf litter, in debris, or under stones are common places to find the Oriental roach. It is also capable of surviving outside in long term freezing weather. They will enter structures under doors thresholds, sliding glass doors, utility pipes, and electrical lines. They prefer to feed on decaying organic matter but will also eat starchy foods. Elimination of the conditions that are conducive to their harborage is important for a succesful treatment. Give us a call, whether you just need a onetime treatment or are on a Monthly or Quarterly Treatment Program we've got you covered.